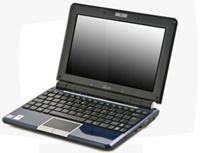 The Eee PC 1000HV is the latest netbook from ASUS that specially designed for enhancing the multimedia performance. The new EE PC 1000HV has similar features of its predecessor ASUS 1000HE except the graphic card which has been replaced with an ATI Mobility Radeon HD 3450 with 256MB of dedicated memory. Along with the Atom N280 processor and 160GB of hard drive, the Eee PC 100HV is also featured with a 10-inch screen with 1024 x 600 pixels, has built-in network adapter and 1GB RAM. Additionally, it is Bluetooth enabled and comes with battery that provides up to 5 hours of life. Hard disk capacity: 160 GB. Reader SD (SDHC) / MMC. Screen: 10 inches WSVGA TFT 1024 x 600 PIXEL. Video Card: AMD HD 3450. I / O Ports: 1 Line In MIC, 1 Headphone Line Out, 1 RJ-45 LAN, 1 VGA D-Sub 15 pin, 3 USB 2.0. Battery: Lithium Ion 6-cell – max 5 hours. Available in blue color, the Eee PC 1000HV is now available in Italy with the price of about 449 euros.